Super Hero Boy: A good night's rest.. what ever mom wishes she had. A good night's rest.. what ever mom wishes she had. Connor is 19 months old and I still have to tell you I have yet to get a full eight hours other than the few days that someone wakes up with him other than me, or he is out of town. Though I cannot blame it totally on him I do stay up insanely late every night answering emails and working on reviews but regardless our ideas of "morning" are very different. So what little time I do get to sleep in bed needs to count and though previous to having a baby I was a horrible insomniac who tossed and turns hours a night I do not have that luxury anymore. Not that I would call insomnia a luxury by no means but needless to say I cannot afford to spend half my sleeping time attempting to sleep. So I've turned to upgrading my bedding to help myself go to sleep faster and stay asleep. The biggest improvement to my sleep has been by far upgrading my pillows from standard pillows to memory foam pillows for two reasons. I just do not get enough support being a side sleeper on any standard fill pillow I have found to date. As well standard fill pillows tend to leave me hot and I end up waking up several times a night to flip my pillow over. This doesn't seem like a big deal but seeing as every time you wake up you are missing out on deep sleep which is the most important type of sleep waking up is really bad when your only getting four to six hours a sleep a night. Memory foam pillows offer at least in my opinion much more support than a typical pillow and I've found I never feel the urge to flip my pillow over as they do not retain heat like a normal pillow. Also for those of you who have never bought pillow covers, and no I'm not talking about pillow cases, you'll be glad to know that most memory foam pillows come standard with their own case so when it comes time to wash your pillow you only have to wash the case and not clean the pillow itself. Not to mention I have never had an issue with a memory foam pillow and my allergies.. ever. Lands End sells a fabulous really reasonablly priced memory foam pillow which would be great for a first time memory foam user or someone looking to add or buy a new pillow. Memory foam pillows can vary from very firm to pretty soft and the Lands End Memory Foam I would rate on the softer of scales. 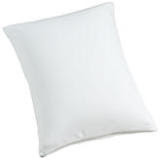 It offers enough support to make even firm pillow loves like me happy but still is soft enough that Connor's dad who loves a soft pillow loves it enough that he has attempted to steal it from me on several occasions. I've been using the pillow a little over two months now and I have to say side by side compared to a Memory Foam Pillow I bought several years ago and paid twice as much the Lands End Memory Foam has performed equally as well and other than being just a tad be on the softer side of what I would usually buy It's fairly hard to tell a difference. Actually usually the only way I can tell any difference at all without looking at the pillow covers is by weight. My more expensive memory foam pillow is a heavier than the Lands End Memory Foam which ironically has always been my number one complaint about my older pillow is its really quite heavy. I have not noticed any compression or wear on the Lands End Pillow and for those of you that are used to using standard pillows you will be pretty pleased to find out that from what I have seen in the 8+ years I have used memory foam pillows they last much longer than a standard pillow as I tend to throw out a standard pillow at the first sign of lumping where a memory foam pillow will never lump up. If you have not tried sleeping on a memory foam pillow or thought they were just too expensive you will be pleased to know that the Lands End Memory Foam pillow starts at $49.50 for the standard sized pillow and it comes with its own pillow cover. Seeing as most pillow covers sell for between $9-19 the Lands End Memory Foam gives you much more bang for your buck than buying a standard pillow and personally I have to say I'd venture to guess that if you have never tried one once you sleep a night on a memory foam pillow you may think twice about sleeping on your old pillow again. The Lands End Memory Foam pillow comes in standard and queen sizing and you can pick one up from the Lands End website!